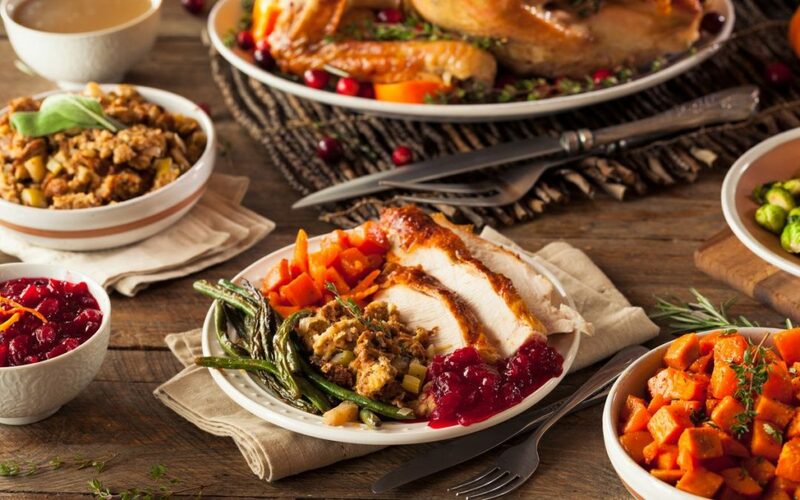 Thanksgiving can be a time of indulgence and lots of food. From turkey, mash potatoes, soups, and pumpkin pie, there are many different dishes people enjoy! Due to this, Thanksgiving can be taxing on your digestive system. These strategies will help aid your digestive system so you can feel better and still enjoy the holiday season. Drinking warm water with lemon when you first wake up can aid in setting up your digestive system for the day. Overnight your body fasts and your liver detoxifies, so drinking warm water as you wake up will flush out your system. The lemon in the water stimulates stomach acid production, which can aid in digestion. This is a great way to start your morning. If you don’t have lemons you can just have warm to hot water. Often we focus on our main meal for Thanksgiving and don’t realize the other foods we eat that day can affect how we feel. Eat a breakfast with fiber to support a regular bowel movement. This will protect you from feeling backed up and constipated. Also, limit your snacks of dry crackers, popcorn, and chips as these also have drying affects on the body. Eat sliced ginger with a drizzle of lemon and a little salt on it around 15 minutes before your largest meal. Ginger is a powerhouse for digestion. This will boost your Agni (digestive fire) and help your body digest the food more easily! Your Agni (digestive fire) is strongest midday. Eating earlier will ensure that you are able to digest your food better and have time before bed to digest your food. If you have time, lay down for 10-15 minutes on your left side. This will aid in helping your body digest the food in your stomach better. Wait an hour and then go on a light walk. Chip bowls with dips, appetizers, cheese and cracker all can make you more full throughout the day with mindless snacking. Snacking too much can make you feel more full and throw off your digestive system. You don’t have to skip snacking all together, but aim to limit mindlessness snacking as much as possible. Have you scarfed down a meal in a few minutes because you felt rushed or excited? Taking time to chew your food is an important part of digestion. Carbohydrate digestion begins in the mouth with an enzyme called salivary amylase. Chewing thoroughly will also make you eat slower, so you can be mindful to not overeat! Not only does chewing help break down your food better, but being mindful of chewing can be a great way to mindfully eat. Have you ever gotten so full after Thanksgiving that you feel like you could burst? Or get a burning indigestion from uncomfortable burps? If you ate too fast or just wanted to help your digestive system out, drink ginger tea to help sooth your stomach. Research shows that ginger can increase gastric emptying, which is the ability for the body to empty food from the stomach. This can be really helpful for Thanksgiving! Ginger can also be helpful with acid reflux symptoms! We hope you enjoy the holiday season! Try a few of these tips to help out your digestive system, so you can have enjoy it with a happy belly and a full heart.